If you would like to visit our showroom, please contact our office to schedule an appointment (see above). Dishwasher Use - all stoneware products under the Thomson Pottery brand are dishwasher safe. We recommend hand washing all other products, including glassware and flatware. 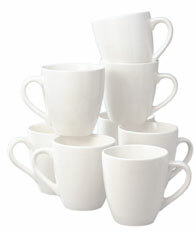 Microwave Use - all stoneware products under the Thomson Pottery brand are microwave safe. However, ceramics can get extremely hot after being used in a microwave, so use caution.